New York City is officially in a Yankees state of mind. The first Yankees World Series victory in nine years turned downtown Manhattan into one giant party that stretched up the Canyon of Heroes to the steps of City Hall, where the champions were given the keys to the city. "It's been too long," said Yankee captain Derek Jeter. "But it feels good to be back ... we really forgot how good this feels." Yankee skipper Joe Girardi, who is changing his number from 27 to 28, said the tenacious character of the team reflected the character of the Big Apple. Pure joy and elation in the moments after the last out in Game 6 of the 2009 World Series. "This team took on the pulse of the city of New York," Girardi said. "This team never gave up." Even Mayor Bloomberg got into the action, taking aim at Phillies shortstop Jimmy Rollins who predicted the Yankees would lose in five games. "I've got a great gift idea," said Bloomberg. "I'm sending Jimmy Rollins a new crystal ball." The City Hall ceremony came to a crescendo when Jay-Z made a guest appearance to perform "Empire State of Mind" the unofficial anthem of the 2009 World Series championship. As early as 5 a.m. screaming fans were lining Broadway and the surrounding streets, throwing confetti, strips of paper, toilet paper and whatever other makeshift ticker-tape they could get their hands on. "I got up at 3:30 in the morning," said Joan Ferrero, of Yonkers. She was clutching an instamatic camera, now full of images of her guys -- Jeter, A-Rod and C.C. The devoted fan snapped her favorites as they emerged from buses at Battery Place and headed to their places on the parade floats. Adding some rockstar power to the sports star shine, Jay-Z shared a float with post-season hero Alex Rodriguez. But school teacher Charisse Castillo, 43, of the Bronx, only had eyes for Jeter. Standing at a prime spot in Battery Park, the parade's start, Castillo was jumping up and down after catching a glimpse of "the Man." "He's poetry in motion," she said, smiling under the brim of a Yankees championship cap. "He is the man. He is the Yankees." The Yankee captain, true to his wholesome, beloved image, rode on his float with his dear old parents. Meanwhile, Hiroko Toya, 32, and Minako Kato, 24 were all smiles in their oversized Yankees jerseys and homemade signs in Japanese letters, praising the series MVP. "Hideki forever," said Toya, of West New York translating the sign Kato had made. "I love you Hideki," said Kato, of Kew Gardens. Both women grew up in Japan and moved to New York to work for a Japanese publisher in Manhattan. And when Matsui arrived at the beginning of the parade at around 10:45 a.m., just before it started, the nearby crowd broke into a roaring chant of "MVP! MVP! MVP!" Spontaneous chants were, of course, the theme of the day, from "John-ny Da-mon!," to "De-rek Je-ter" to "Let's Go Yankees!" "I've been waiting since four in the morning," shouted fan Crystal Barnhard, who was pressed up against the metal barricades at Murray and Broaday amongst the din of pinstriped excitement. "They are my number one team!" The parade was closed out in perfect fashion, with a beaming Mariano Rivera waving his Panamanian flag as he celebrated on top of a float with his children. The crowd, which was estimated at up to 3 million screaming people, was mostly peaceful, but there were some scary moments as a group of fans jumped on an NBC New York news truck, breaking the satellite dish and nearly overturning it. Asked about the difficulties of policing, Commissioner Ray Kelly took a break mid-parade route, to talk to NBC New York. "There's a lot of people here, said Kelly. "This is certainly one of the biggest crowds I've ever seen at a ticker tape parade." He also commented on the Yankees themselves, calling them overpowering. "I think they probably have the best infield in the history of baseball," said Kelly. The parade seemed like one of the loudest and largest in recent memory, and even former Mayor Rudy Giuliani commented, "Best crowd since '96 -- this is what 2001 would have been like if we had won." Some observers did say that it seemed like less actual confetti this year -- perhaps as a result of office windows being locked shut -- but rolls of toilet paper were being unfurled everywhere. 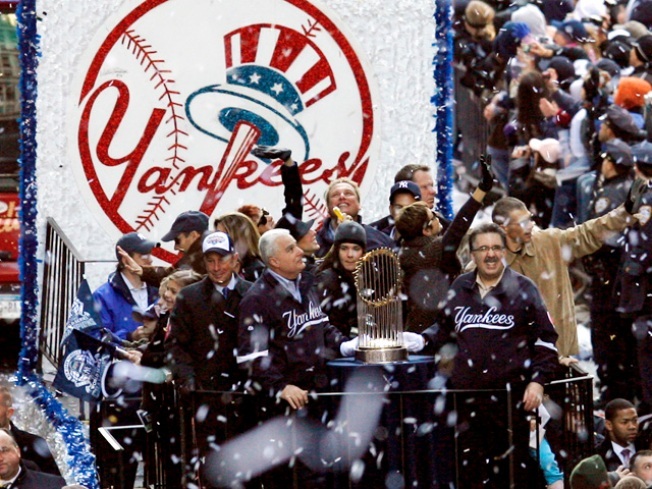 Yankees fans had waited nine years since the team's previous World Series title, a Subway Series against the Mets, in 2000, and their celebratory exuberance couldn't be stopped. New York City's 178th ticker-tape parade was the first since Feb. 2008, when the Giants won the Super Bowl against the lowly New England Patriots. 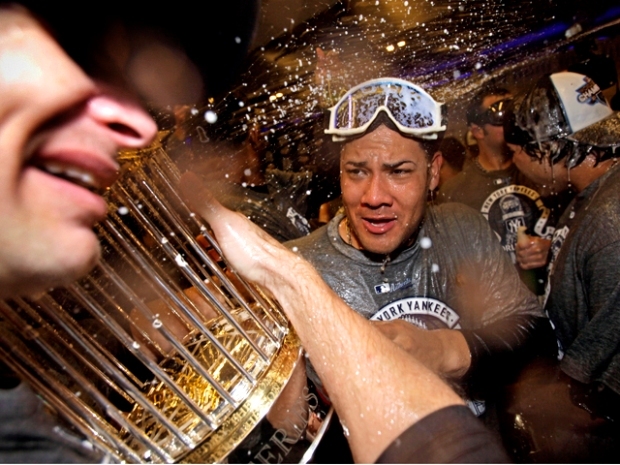 Officials said the Yankee parade will cost about the same as the Giants' did, which was about $331,000. After the parade, the Yankees, a few fans lucky enough to get tickets, headed over to City Hall for a special ceremony where the mayor handed over the keys to the city to the team.